Sunday, February 8th 2015: Info-graphic! Sunday, February 8, 2015: This is an infographic I (more or less) created when I was test a info-graphic making website called easel.ly! 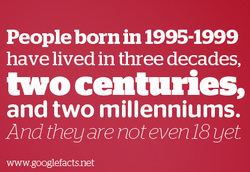 They were born in the 90's so from 1990s, 2000, and 2010 is the three decades. The two centuries are 1900 and 2000. The two millenniums are 1000 to 2000. Click here to hide chemical name of titin.